Our Ultimate 4×4 Trips Collection by Mariëlle Renssen is for all travellers who want to get their 4×4’s onto dirt roads. The book offers 22 fantastic 4×4 routes which have been driven and verified from the author’s own personal experience. Our Ultimate 4×4 Trips Collection consists of detailed maps and 22 great routes which include accommodation, top sites, tourist resources, a fauna and flora checklist, packing list, geological information, full-colour photographs throughout, best and worst experience per trip, turn-by-turn descriptions of the routes driven, facts on each region, GPS points and a road atlas section of Southern Africa. The Book includes a bonus CD with GPS tracks of each route, and a PDF image of each route map. The book will inspire you to travel and make you believe that you are capable of putting together stunning nature tours, without the assistance of a travel agent. You don’t need to be a Rambo to attempt these routes. You will be so bitten by the back-road bug that offers zero cellphone reception or Wi-Fi. You will end up wanting to do more and more. Or if you are an armchair traveller, simply experience these routes through the eyes of the author, to see some of the most amazing places in the world. This is a must-have book for all 4×4 owners and travellers. See Southern Africa like never before. Mariëlle Renssen was born in Zimbabwe to Dutch parents, lost her heart to Cape Town while obtaining her BA degree, lived in New York City twice, and is now settled in Knysna … which firmly puts her in the ranks of roving gypsy. Travel has and always will be in her blood. After having been lured to work in the Big Apple for three years for a teenage magazine, homesickness reined her in and she returned to Cape Town, where she joined what was then Struik New Holland Publishers. She loved it so much she put down roots and stuck around for 12 years. 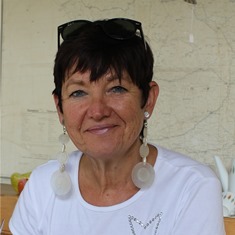 As an editor and writer for Struik’s international travel division, she visited Kuala Lumpur, Singapore, Mauritius, London and Sydney. Because she and husband Hirsh have a lock-up home with no kids, no pets, no Tweetys, they will pack a suitcase in a heartbeat – which they do, regularly. They’ve journeyed from Jordan, Israel, Turkey and Greece all the way to Spain. In America they’ve snow-skied in Vermont, holidayed at Nantucket and Martha’s Vineyard, seen the Lincoln Memorial in Washington D.C., got frostbite in Chicago and walked San Fran’s Golden Gate Bridge. Since then Mariëlle has turned to travel writing for MapStudio, for whom she has penned more books than she can count, exploring the length and breadth of Southern Africa in two 4x4s with Hirsh and a travelling friend. Their latest adventure, which took them to south-western USA, was a two-month, 10,000km exploration of the national parks in America’s mountain states. It blew them away. So they wrote an e-book about it. In World Atlas of Food, the intensive research made it Mariëlle’s most challenging project to date, but stimulate the senses it did and her suitcase is already packed for her next trip into the far beyond. Be the first to review “Our Ultimate 4×4 Trips Collection” Click here to cancel reply.